Class representing a cache/ephemeral data store. This interface is intended to be more or less compatible with the PHP memcached client. Callers should use the proper factory methods that yield BagOStuff instances. Site admins should make sure the configuration for those factory methods matches their access scope. BagOStuff subclasses have widely varying levels of support for replication features. For any given instance, methods like lock(), unlock(), merge(), and set() with WRITE_SYNC should semantically operate over its entire access scope; any nodes/threads in that scope should serialize appropriately when using them. Likewise, a call to get() with READ_LATEST from one node in its access scope should reflect the prior changes of any other node its access scope. Any get() should reflect the changes of any prior set() with WRITE_SYNC. Definition at line 58 of file BagOStuff.php. asyncHandler: Callable to use for scheduling tasks after the web request ends. In CLI mode, it should run the task immediately. reportDupes: Whether to emit warning log messages for all keys that were requested more than once (requires an asyncHandler). syncTimeout: How long to wait with WRITE_SYNC in seconds. Definition at line 108 of file BagOStuff.php. References $params, null, and setLogger(). Referenced by incrWithInit(), lock(), mergeViaCas(), and trackDuplicateKeys(). The callbacks may or may not be called ever, in any particular order. They are likely to be invoked when something WRITE_SYNC is used used. They should follow a caching pattern as shown below, so that any code using the work will get it's result no matter what happens. Definition at line 673 of file BagOStuff.php. Definition at line 343 of file BagOStuff.php. References $success, $value, doGet(), lock(), null, and unlock(). Definition at line 377 of file BagOStuff.php. References $cache, false, merge(), and use. Definition at line 640 of file BagOStuff.php. Referenced by incrWithInit(), lock(), and mergeViaCas(). Definition at line 701 of file BagOStuff.php. Referenced by SqlBagOStuff\cas(), RedisBagOStuff\changeTTL(), SqlBagOStuff\changeTTL(), SqlBagOStuff\insertMulti(), and HashBagOStuff\set(). If an absolute time is specified which is in the past, use a short expiry time. Definition at line 716 of file BagOStuff.php. Referenced by RedisBagOStuff\add(), RedisBagOStuff\changeTTL(), RedisBagOStuff\set(), and RedisBagOStuff\setMulti(). Definition at line 680 of file BagOStuff.php. Referenced by RedisBagOStuff\deleteMulti(), SqlBagOStuff\fetchBlobMulti(), RedisBagOStuff\getMulti(), RedisBagOStuff\logRequest(), and RedisBagOStuff\setMulti(). Definition at line 596 of file BagOStuff.php. Definition at line 573 of file BagOStuff.php. References $res, as, and incr(). callable | bool $progressCallback Optional, a function which will be called regularly during long-running operations with the percentage progress as the first parameter. Definition at line 524 of file BagOStuff.php. Referenced by cas(), get(), mergeViaCas(), and trackDuplicateKeys(). Definition at line 692 of file BagOStuff.php. Referenced by RedisBagOStuff\changeTTL(), and convertToExpiry(). Get an item with the given key. If the key includes a deterministic input hash (e.g. the key can only have the correct value) or complete staleness checks are handled by the caller (e.g. nothing relies on the TTL), then the READ_VERIFIED flag should be set. This lets tiered backends know they can safely upgrade a cached value to higher tiers using standard TTLs. Definition at line 180 of file BagOStuff.php. Referenced by Wikimedia\Rdbms\ChronologyProtector\shutdown(), and BagOStuffTest\testReportDupes(). Definition at line 812 of file BagOStuff.php. Referenced by convertToExpiry(), convertToRelative(), HashBagOStuff\expire(), and getScopedLock(). Definition at line 632 of file BagOStuff.php. Definition at line 535 of file BagOStuff.php. Definition at line 783 of file BagOStuff.php. Referenced by MWLBFactory\injectObjectCaches(), and Wikimedia\Rdbms\ChronologyProtector\shutdown(). Note that the same lock cannot be acquired twice. This is useful for task de-duplication or to avoid obtrusive (though non-corrupting) DB errors like INSERT key conflicts or deadlocks when using LOCK IN SHARE MODE. Definition at line 492 of file BagOStuff.php. References getCurrentTime(), lock(), null, unlock(), and use. Definition at line 151 of file BagOStuff.php. Referenced by decr(), deleteMulti(), and incrWithInit(). Definition at line 612 of file BagOStuff.php. References add(), clearLastError(), getLastError(), and incr(). Definition at line 734 of file BagOStuff.php. Referenced by HashBagOStuff\incr(), WinCacheBagOStuff\incr(), RESTBagOStuff\incr(), APCBagOStuff\serialize(), APCUBagOStuff\serialize(), APCBagOStuff\unserialize(), and APCUBagOStuff\unserialize(). Definition at line 406 of file BagOStuff.php. References $code, $fname, add(), clearLastError(), getLastError(), and use. Referenced by cas(), getScopedLock(), and Wikimedia\Rdbms\ChronologyProtector\shutdown(). Definition at line 762 of file BagOStuff.php. Referenced by Wikimedia\Rdbms\ChronologyProtector\__construct(), Wikimedia\Rdbms\ChronologyProtector\getTouchedKey(), and BagOStuffTest\testMakeKey(). Make a cache key, scoped to this instance's keyspace. Definition at line 774 of file BagOStuff.php. Referenced by CryptHKDF\__construct(), FileCacheBase\cacheMissKey(), SiteStatsUpdate\getTypeCacheKey(), and BagOStuffTest\testMakeKey(). Definition at line 746 of file BagOStuff.php. References $args, $keyspace, and as. Referenced by makeGlobalKey(), makeKey(), and BagOStuffTest\testMakeKey(). The callback function returns the new value given the current value (which will be false if not present), and takes the arguments: (this BagOStuff, cache key, current value, TTL). The TTL parameter is reference set to $exptime. It can be overriden in the callback. Nothing is stored nor deleted if the callback returns false. Definition at line 275 of file BagOStuff.php. 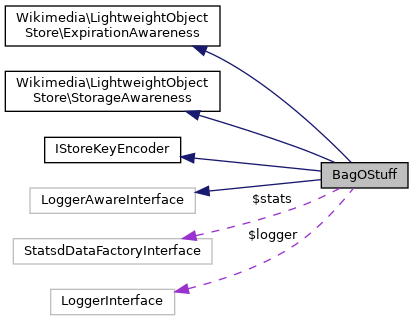 Merge the flag maps of one or more BagOStuff objects into a "lowest common denominator" map. Definition at line 793 of file BagOStuff.php. Referenced by ReplicatedBagOStuff\__construct(), and MultiWriteBagOStuff\__construct(). Definition at line 289 of file BagOStuff.php. References $success, add(), cas(), clearLastError(), doGet(), false, getLastError(), and null. Referenced by merge(), and SqlBagOStuff\merge(). Referenced by Wikimedia\Rdbms\ChronologyProtector\shutdown(), and BagOStuffTest\testMerge(). Definition at line 135 of file BagOStuff.php. Definition at line 649 of file BagOStuff.php. Referenced by MemcachedPeclBagOStuff\checkResult(), RedisBagOStuff\getConnection(), RESTBagOStuff\handleError(), RedisBagOStuff\handleException(), and SqlBagOStuff\setAndLogDBError(). Definition at line 128 of file BagOStuff.php. Definition at line 820 of file BagOStuff.php. Definition at line 555 of file BagOStuff.php. Definition at line 190 of file BagOStuff.php. References $value, add(), as, doGet(), and null. Definition at line 458 of file BagOStuff.php. Definition at line 68 of file BagOStuff.php. Definition at line 88 of file BagOStuff.php. Definition at line 82 of file BagOStuff.php. Definition at line 73 of file BagOStuff.php. Definition at line 79 of file BagOStuff.php. Definition at line 75 of file BagOStuff.php. Definition at line 64 of file BagOStuff.php. Referenced by WinCacheBagOStuff\makeKeyInternal(), MemcachedBagOStuff\makeKeyInternal(), and makeKeyInternal(). Definition at line 62 of file BagOStuff.php. Definition at line 60 of file BagOStuff.php. Definition at line 66 of file BagOStuff.php. Referenced by MultiWriteBagOStuff\doWrite(), and setLogger(). Definition at line 77 of file BagOStuff.php. Definition at line 70 of file BagOStuff.php. Definition at line 85 of file BagOStuff.php. Definition at line 91 of file BagOStuff.php. Definition at line 92 of file BagOStuff.php. Referenced by ParserCache\get(), and ParserCache\getKey(). Definition at line 95 of file BagOStuff.php. Referenced by MediaWiki\Session\SessionBackend\save(), and CachedBagOStuffTest\testWriteCacheOnly(). Definition at line 94 of file BagOStuff.php. Referenced by MediaWiki\Session\SessionBackend\save(), and MultiWriteBagOStuffTest\testSyncMerge().